Beep beep beep! That was the sound of the dishwasher letting the sleeping world know that it was done its job. It worked tirelessly through the night and proclaimed at 2:14am that it was finally done. “Thank goodness” I thought as I raised my head from the pillow to check the time. The next morning, it was cleaning day, so I had to get stuff out of the way so the house cleaners could do their job more efficiently. I decided to unload the dishwasher so that I could have a place to store all the dirty ones throughout the day. I opened the dishwasher door and, to my surprise, it wasn’t as full as usual. I thought to myself, “Oh that’s nice, my wife must have started unloading it before she left for work”. You see, the one thing more joyous than a dishwasher full of clean dishes is an empty one to put dirty ones into. I was almost done unloading when an alarming thought went through my head. I started going through all the facts. I had heard the dishwasher running before I went to sleep. And I was awoken by it when it declared its completion. The dishes looked clean and the door had no food or drippings on it. Everything was telling me that YES, they were clean. But something in that moment made me doubt my thinking. In my panic, I started inspecting the dishes that were left. And as I rubbed my thumb along one of the plates, I could feel this slight bit of grit on it. “F%@& don’t tell me…” (I said quietly in my head of course). But I still wasn’t sure—and I definitely didn’t want to go hunting for the dirty dishes that I had just dispersed into every cupboard and reload them back into the dishwasher. So the only thing left to do was to ask my wife—the one that had been responsible for me being awoken by all of this in the first place. “Not clean. Just rinse”, she said. Full text dialog included here for your amusement. 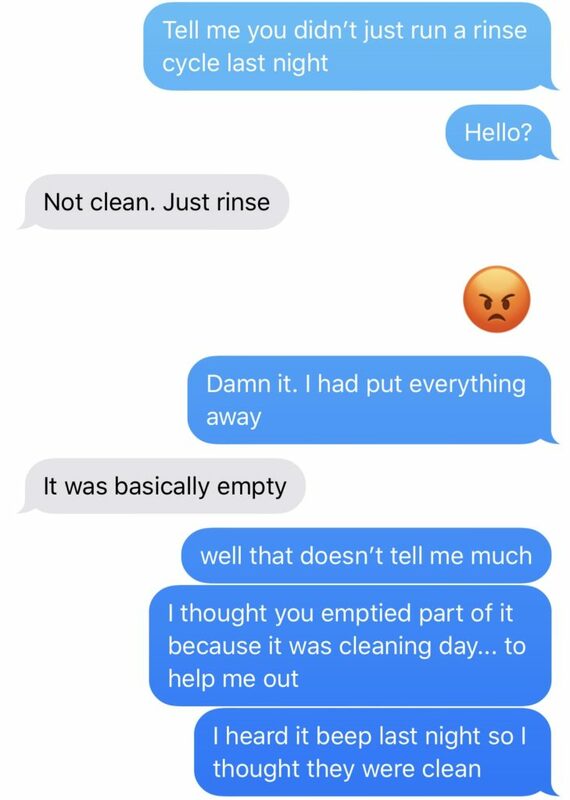 What I learned from all of this is that despite all the facts that I had: knowing that the dishwasher was running, hearing it beep, and the dishes “looking clean”, I couldn’t determine, for certain, that my assumption was correct. And the only way to really find out was to ask for more information. You see, we have a way of convincing ourselves that something is true. We find all the proof to make the story in our heads correct. This was a classic—and harmless (sharing germs with family is no big deal, right? )—example of this, but how many times have your assumptions been wrong and resulted in much worse happening? How much stress and agony have we put ourselves through because of bad assumptions? If you’re anything like me, then it’s a countless number of times. 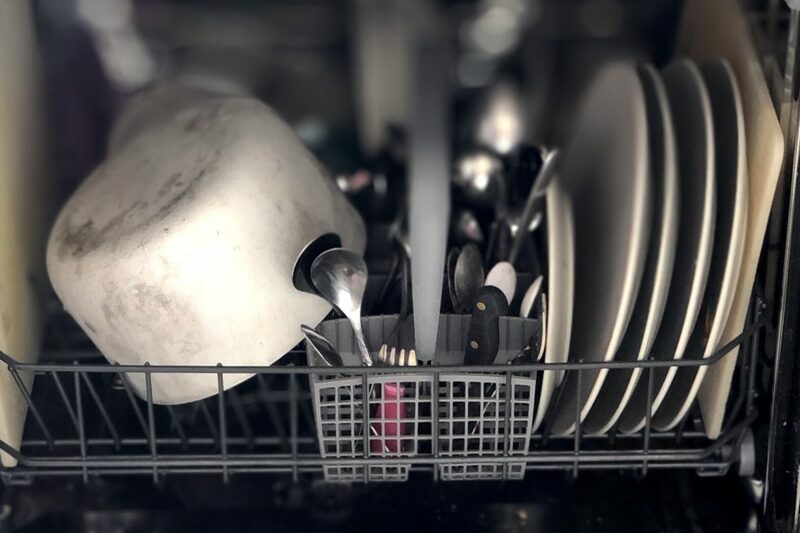 So the next time you’re in a situation where you don’t have all the facts—and especially when you have that feeling that something isn’t jiving—before putting all the dishes away, run the dishwasher test and ask yourself: “do I know—for certain—that these dishes are clean?”. If the answer is “no”, then go ahead and ask for more information. It just might save you from whatever mess you were about to get yourself into.